Lincolnshire-based LJ Fairburn never intended to become the largest independent egg producer and packer in the country. In fact, they never intended to become an independent packer at all. Up until five years ago, the third-generation family business, based at Alford, was a contract producer for Noble Foods. But after negotiations on price reached a stalemate, the family decided to walk away and set up on their own. Since then it has invested heavily in state-of-the-art equipment, land and livestock, and signed contracts with many of the UK’s major multiples, plus launched its own award-winning speciality products and has actively built its own network of farming producers. LJ Fairburn is now supplying 17 million British Lion-approved eggs each week to seven leading retailers and its growth looks set to continue. It’s a success story that’s just won them the title of Poultry Business of the Year, at the National Egg & Poultry Awards, which the family collected at the ceremony and awards dinner on 26 June in at Kensington Garden Hotel in London. So how has the business managed to grow so much and become the largest independent producer and packer of eggs in such a short timeframe? In short, it’s involved a lot of investment. 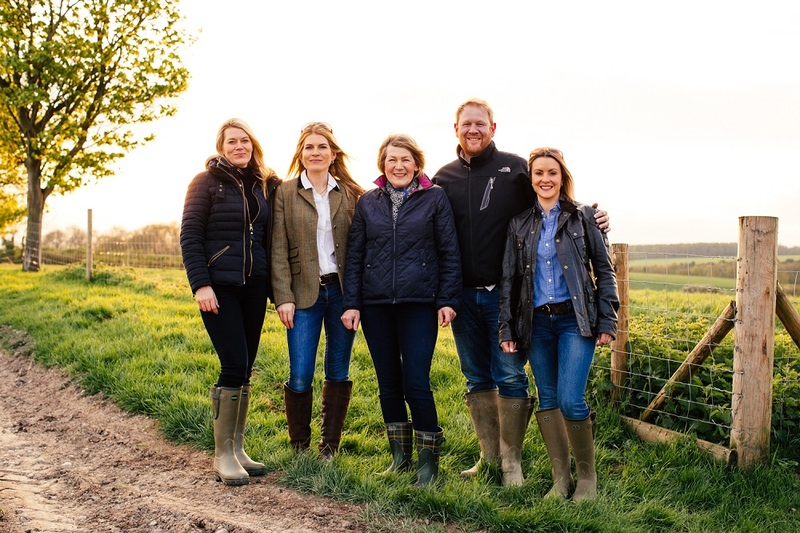 “When we first went alone and left Noble Foods we only had a packing centre that was in line with colony, but we needed to have a packing centre that could pack all our organic, all our barn eggs and all our free-range,” says Sarah-Louise. The business now has 80 units across 17 farms and has two high-tech packing centres. Milling, manufacture of bespoke feeds, pullet rearing and egg production all take place on site. When the first packing centre was opened it was 30,000 square feet. “We thought it was going to be plenty,” says Sarah-Louise. Now, it’s expanded into the unit next door and floor space has doubled to 60,000 square feet, plus a mezzanine floor has been installed to store packaging materials. Automation has been particularly important because the business handles so many different types of egg – 84 in total – from Taste the Difference Golden Yolk for Sainbury’s to Asda Extra Special, organic, blue eggs, and dozens of other lines for different retailers. In the next 12 months there will be continued investment in its packing centres, as well as new offices, staff welfare facilities and an innovative development kitchen. Big changes are also afoot in the farming operation. The business has made the decision to phase out enriched colony cages far ahead of the 2025 deadline and move to barn systems for its value egg offering. Currently colony cages make up around 15% of the business, with the majority free-range and organic. Sarah-Louise says they’ve decided to switch to barn systems rather than go totally free-range because of the risk of undermining the status of free-range as a premium product and stripping value out of the supply chain. The changes are already underway, despite the fact they only installed some of the newer colony systems in 2012 and are still paying for them. “We want to be cage-free well ahead of 2025 as a family,” she says. Converting the systems to barns isn’t an easy or cheap, but Sarah-Louise says it’s the right move. “Actually I hated the old caged systems because I wasn’t from farming originally. When I first went in a caged shed I said, ‘I hate this, I really don’t’ like this’. And when we changed over to the new enriched systems in 2012, both Daniel and I said we feel a lot better about this, and Daniel said to me at the time, ‘Yes, but our children won’t like this’. “So now we think we should have gone straight to barn in 2012 [rather than covert battery cages to enriched colony systems]but hindsight is a wonderful thing, and it’s what everyone was doing at the time. She expresses some concern that if too many retailers and egg producers convert to free-range once retailers stop taking caged eggs in 2025, there will be no basic tier and the value will be stripped out of the market because free-range will be seen as a baseline. Despite this, the majority of Fairburn’s business is free-range and organic, and this side of the business is continuing to grow, with organic production up 22% in the past year alone. Also in the past year new laying sheds have been added and a new organic milling line installed. The firm has also grown its network of trusted farming partners to 40 – as well as buying their eggs, Fairburn’s purchases raw materials from many of them to mill into top quality feed at its own milling centre. And there has been further investment in its 18-strong lorry fleet delivering to supermarkets across the UK and has expanded its staff team to 250 employees. The next 12 months will see further focus on developing higher welfare, artisan-style egg products by Fairburn’s in-house geneticist and breeding team. This work has resulted in the development of a new breed, the British blue, which was bred from the grandparent stock to the birds that are in lay today, producing a blue-hued egg which is unique to Fairburn’s. That means on a practical level Fairburn’s is trying to find commercial uses for what at the moment are waste products. “We want to make sure we are completely utilising the supply chain,” she says. The firm is looking into setting up an operation to manage its own second eggs. “We’re also setting up projects to see if there’s anything we can do with premium speciality dishes using old hen meat for example. We’re looking at so many different avenues with anything that’s a waste product.